This past weekend was the first game of the season for my son’s travel soccer team. As with past years, my husband and I like to watch the games. My daughter, definitely, does NOT. For most of her life, she has been dragged, unwillingly, to soccer/baseball/hockey games in the heat, snow, rain (she sat in the car for that one), and dark. 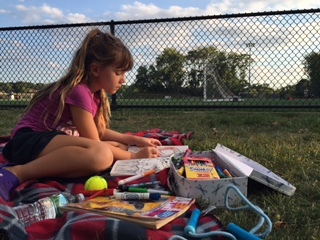 Occasionally there is a playground where she can swing or climb during the game, and, even more rarely, there is another player’s younger sibling whom she can play with there. But usually she is “bored,” insists on sitting on my lap, or begs for the ice cream truck or my phone for the hour-plus we are there (hey, and I don’t blame her!!). To help us all weather through these games with fewer complaints and less screen time, my daughter and I put together a Survival Kit for her to take along. We fill a bag with inexpensive crafts and toys from home or the dollar store to keep her happily entertained on game days. She can only play with the things in the bag during the game, not at home, so she won’t get bored with them as quickly. Craft supplies (pipe cleaners, stickers, etc.) or simple craft kit. This past week, she and a few other teammates’ siblings sat on a blanket and made pipe cleaner glasses, bracelets, and animals for over an hour! A list of simple pencil and paper activities they can do alone or with another kid, such as Dots and Boxes, Hangman, Pictionary, M.A.S.H., Squiggles, and Tic-Tac-Toe. Click here for more game ideas. Just before summer break a few years ago, I used the extra class funds to buy each kid in my son’s class a clipboard and pad of blank paper. On the back of each clipboard, I listed activities they could do to promote summer writing, art, or creativity – make a family newspaper, write a movie of book critique, make a cartoon, do leaf or bark rubbings, design a board game, etc. Snack and a drink (remember to replenish these before the next game!). I tell my daughter that she can eat the snack any time she wants. She doesn’t have to ask for permission. This frees up me to watch the game, but she also loves the freedom of determining when she wants to eat it. Before last week’s game, my daughter and I dumped out last year’s Survival Kit and took inventory in preparation for the new season. She enjoyed deciding what to include in the kit, weeded out the coloring books that no longer interested her, and found a few things around the house to add to the bag. On game day, she packed her bag in the car with a smile on her face. It happened to be a warm sunny day, and she knew a new teammate’s sister was going to the game, too, but I like to think that just a little of that smile was due to the Sibling Sport Survival Kit.